In small bowl, mix pecans and bourbon. Cover and refrigerate 8 hours or overnight. Heat oven to 375°F. In 13x9-inch ungreased baking dish, place sweet potatoes and water; cover with foil. Bake about 45 minutes or until potatoes are tender. Drain water; cool sweet potatoes 10 minutes. 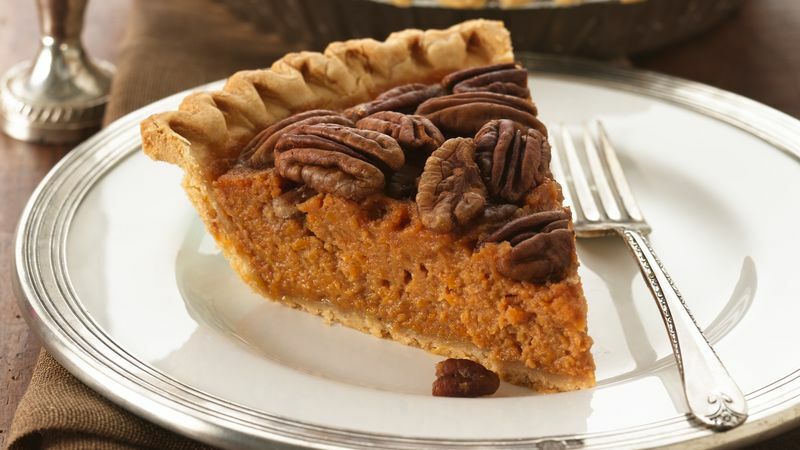 Pour filling into frozen pie crust; sprinkle with pecans. Bake about 45 minutes or until filling puffs and is lightly browned and knife inserted in center comes out clean. Cool completely, about 3 hours. Serve with whipped cream. Cover and refrigerate any remaining pie. Pillsbury Pet-Ritz® frozen pie crusts make it easy to bring a homemade pie to a gathering because the crust comes in a handy disposable pan.